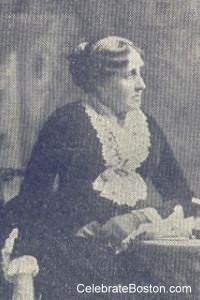 "Louisa May Alcott, Transcendentalist novelist (1832-1888). The famous author of Little Women, Little Men, and Old Fashioned Girls, had made her beginning, as have many who have done any good or acquired fame in the world, by depending on herself. In other words, she was the architect of her own fortune, and has left be hind her works that will endure to gladden the hearts of millions of boys and girls. But she has done more. She has left behind her a record of a life within itself, a benediction and inspiration to every thoughtful girl who reads it. While Miss Alcott always considered New England her home, she was actually born in Germantown, Philadelphia, November 29, 1832. Her father, Amos Bronson Alcott, after his marriage in New England, accepted a position as principal of a Germantown Academy, which he occupied from 1831 to 1834, and afterwards taught a children's school at his own residence, but he was unsuccessful and he returned to Boston in 1835, when Louisa was two years old. From this time forward, Mr. Alcott was a close friend and associate of the poet and philosopher Emerson, sharing with him his transcendental doctrines, and joining in the Brook Farm experiment of ideal communism at Roxbury, Mass. The Brook Farm experiment brought Mr. Alcott to utter financial ruin, and after its failure he removed to Concord, where he continued to live until his death. It was at this time that Louisa, although a mere child, formed a noble and unselfish purpose to retrieve the family fortune. Two years after this brave start Miss Alcott's earliest book, Fairy Tales, was published (1855). About the same time her work began to be accepted by the Atlantic Monthly and other magazines of reputation. During the winters of 1862 and 1863 she volunteered her services and went to Washington and served as a nurse in the government hospitals, and her experiences here were embodied in a series of graphic letters to her mother and sisters. These letters she revised and had printed in the Boston Commonwealth in the summer of 1863. They were afterwards issued in a volume entitled Hospital Sketches and Camp-Fire Stories. This was her second book, which, together with her magazine articles, opened the way to a splendid career as an author. The chief aim of Miss Alcott seemed to have been to make others happy. Many are the letters treasured up by young authors who often, but never in vain, sought her advice and kind assistance. To one young woman who asked her opinion on certain new books, in 1884, she wrote: 'About books; yes, I've read Mr. Isaacs and Dr. Claudius [F. Marion Crawford fame], and like them both. The other, To Leeward, is not so good; Little Pilgrim was pretty, but why try to paint heaven? Let it alone and prepare for it, whatever it is, sure that God knows what we need and deserve. I will send you Emerson's Essays. Read those marked. I hope they will be as helpful to you as they have been to me and many others. They will bear study and I think are what you need to feed upon now.' The marked essays were those on Compensation, Love, Friendship, Heroism, and Self-Reliance. Miss Alcott's kindness for young people grew with her advancing years. Being a maiden lady without daughters of her own, she was looked up to and delighted in being considered as a foster-mother to aspiring girls all over the land. How many times she wrote similar sentences to this: 'Write freely to me, dear girl, and if I can help you in any way be sure I will.' This was written to one she had never seen and only four years before her death, when she was far from well. Miss Alcott died in Boston, March 6, 1888, at the age of fifty-six years, and just two days after her aged father, who was eighty-five years old, and who had depended on her many years, passed away. Though a great advocate of work for the health, she was, no doubt, a victim of overwork; for it is said she frequently devoted from twelve to fifteen hours a day to her literary labors, . . . besides looking after her business affairs and caring personally for her old father, for many years an invalid. In addition to this, she educated some of her poor relatives, and still further took the place of a mother to little Lulu, the daughter of her sister, May, who died when the child was an infant."